Which ExpoTron video wall is right for me? These questions will help determine the perfect screen for you. If you need a video wall system installed indoors as a permanent display one of our Galileo Series video walls will be perfect. If you need a video wall that can be packed up and move from venue to venue, choose a Newton Series video wall package, either indoor or outdoor model. These screens are perfect for concerts, dj setups, theaters, clubs, churches and schools amphitheaters or outdoor patios, and more. What LED Resolution (pixel pitch)? The pixel pitch of an LED video panel is simply the distance from the center of one pixel to the center of the next pixel. The smaller the pixel pitch, the higher the resolution which results in a clearer image at a closer viewing distance. To determine the best pixel pitch for your screen, first find how close to the video wall your average viewer normally be. For venues with viewers close to the video wall, a small pixel pitch will be needed, for larger venues such as churches, gymnasiums, or outdoor fields, a larger pixel pitch will still offer a high resolution image. Once you have the average distance your viewer will be from the screen you can do any easy calculation to determine the pixel pitch that is optimal for your project. Our ExpoTron team is also happy to help you with this. To find the best pixel pitch simply divide your viewing distance by 8. For example, if you want a video wall that will be viewed from 24 feet away, take 24/8 which equals 3. 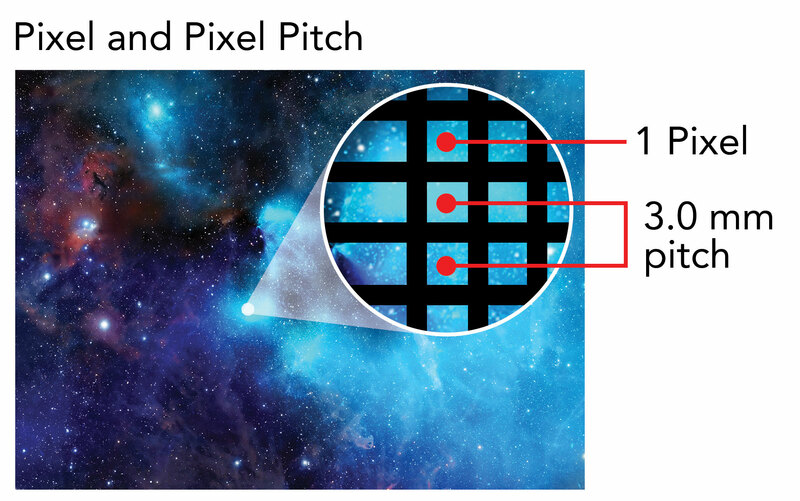 Thus, a 3mm pixel pitch is the optimal pitch for your screen. 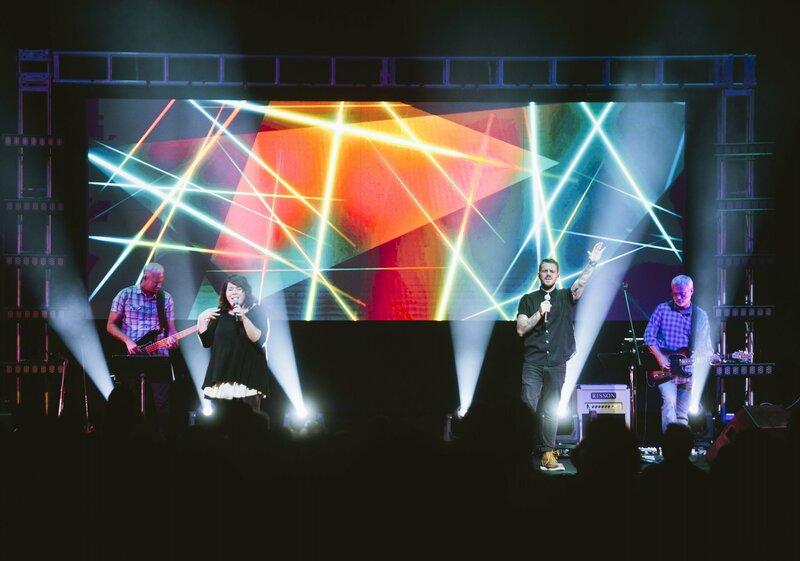 We offer a wide variety of screen sizes to bring your vision to life, from smaller portable screens perfect for temporary events, to large permanent installations for scoreboards or churches. Our design and engineering team can help you get the perfect size for your needs. Screen size, along with pixel pitch, will make up the total resolution and aspect ratio for your display. Content can be displayed on any aspect ratio and resolution, however based on your needs you may find more common aspect ratios and resolutions to be most desirable. For example, full high definition video files are 1,920 x 1,080 pixels, and the recently popular 4K is four times that at 4096 x 2160. Based on your needs we can provide a screen to match either of these requirements. A full HD 1920 x 1080 resolution is generally recommended. 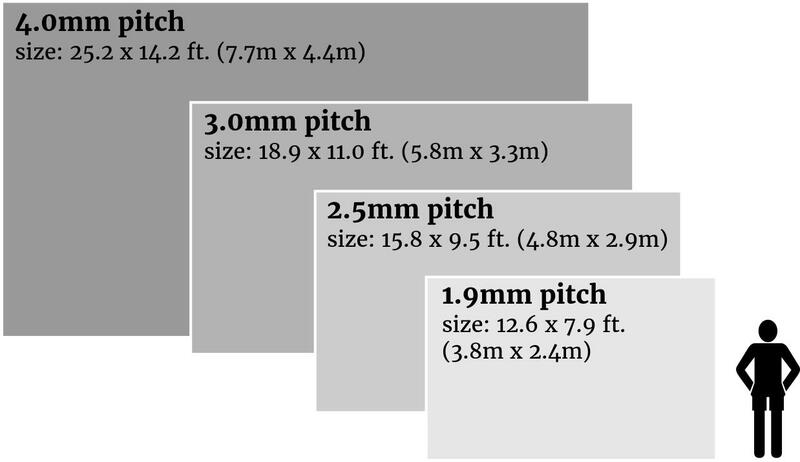 This image shows the maximum pixel pitch needed for the screen sizes shown. You’ll notice that as a screen size increases, the pixel pitch needed to keep the same HD resolution decreases.